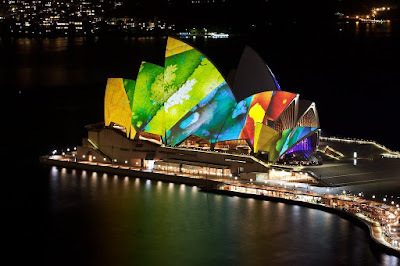 Last night saw the final of the Vivid Festival at work - the wonderful images that had been projected onto the sails were turned off, the Opera Theatre started resetting for the Opera season and the ambient soundscape in the Studio was silenced. The entire Opera House had virtually been handed over to Brian Eno to play with and the majority of performance spaces were featuring something he had curated. Normally this period between the Ballet and Opera Season is a quiet time but the past few weeks have seen the Opera Theatre ringing to the sounds of Heavy Metal Rock and esoteric performances. I think quite a bit of dust was shaken out of the fly tower in the process. One of my favourites was the 77 Million Paintings in the Studio which, I'm afraid, reminded me of 77 Million Quilting Blocks, but it was still soothing and pleasant to look at. In keeping with this atmosphere of creative energy I've started on my own Festival of Colour and Texture with an unparalleled outburst of Sock Knitting. One pair finished, three more on the needles and a growing queue of potentials. The recent Darling Harbour Craft show helped fuel this with tempting skeins of Jitterbug in rich gold and deep greens, Noro Sock yarn and Touch Yarns Merino. I thought I was remarkably restrained in my purchases at the craft fair but that may have been because I was (once again) juggling work and social obligations and as always, had to be somewhere else. I missed out on the wonderful WWKIP curated by Sally - another Festival of Yarn and Magic attended by numerous devotees and, other than a strange threat from the Darling Harbour Event Organisers to call the Knitting Police if any "teaching of Knitting techniques" occurred, it was a great success. We missed you at WWKIP! I was so sorry not to see you at WWKIP, but if making the Opera House look so very beautiful was partly the cause of your absence, then it's excusable that you didn't come. I bought some jitterbug as well. Can't wait to try it out but I'm thinking I might knit something else with it instead of socks.